In one of my previous WooCommerce article, I discussed How to Add WooCommerce Custom Fields to Products In this post, I will discuss how to add custom fields to WooCommerce Product Variations. Once custom fields are enabled to your product variations it will feel native to WooCommerce, making it easy for your shop managers to enter additional product information. The method is more or less the same what I explained in my previous post regarding custom fields. Just like before we will be working on the file functions.php (default location to add custom function) of your theme folder. woocommerce_product_after_variable_attributes — contains code for displaying the newly added fields. woocommerce_save_product_variation — will save the values in the custom fields. Using, wp.template it is now easy to display variations custom fields value. 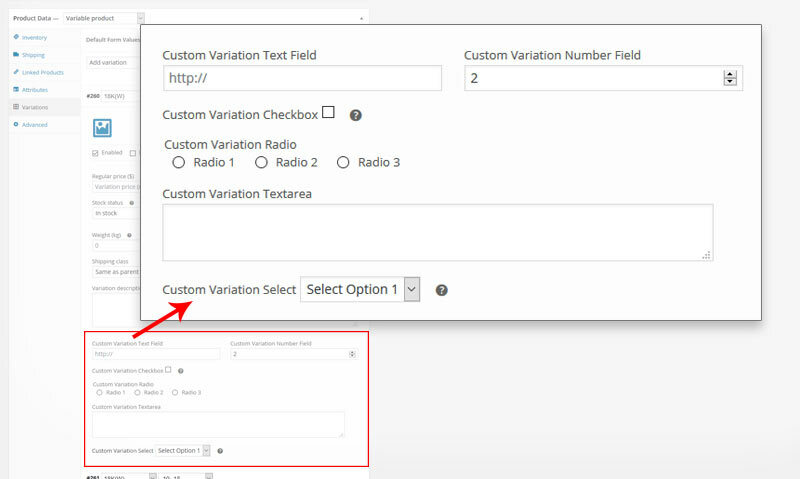 Next, make changes to the custom template that displays the variation fields. The file is named variation.php (located in wp-plugins/plugins/woocommerce/templates/single-product/add-to-cart/). Do not edit variation.php file directly. Instead, create a copy in the folder woocommerce/templates/single-product/add-to-cart/ in your theme folder. I hope you found this post useful. Please be generous to help others by sharing it on Facebook, Twitter, or LinkedIn using the buttons below. This worked brilliantly for me, it was exactly what i needed, it did break a few things design wise but they just needed some css to fix. i’m struggling with adding new custom product fields to my WC site. basically what I need is to add a new custom sale price block under the general tab (for simple product and variation product), which will contain a text field for the price (this is simple and i’ve managed to do it), but instead of the description, I’d like to add a Schedule button to show another 2 fields for the 2 datepickers (start and end of the offer), just like the default sale price of WC. Thank you for great tutorial, Do you perhaps know how to display the field in the export csv file using CSV Import Suite.